The UFC has wasted no time in filling out the roster for their first foray into Sweden. A week after announcing the April 14th event, the wold’s premier mixed martial arts organization confirmed seven fights for the card. 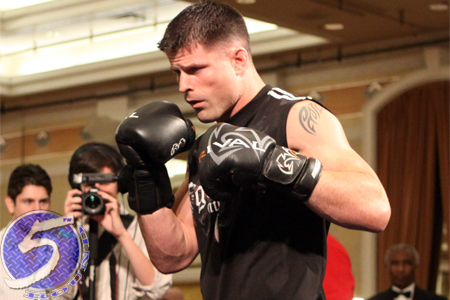 Brian Stann (Pictured) and Alessio Sakara are the biggest names scheduled to appear thus far, so the middleweights are the current frontrunners to serve as the show’s featured attraction. Following his quick TKO victory over Vladimir Matyushenko at UFC 141, Alexander Gustafsson expressed great interest in competing in front of his countrymen. It’s possible the fast-rising light heavyweight could be added to the card shortly. The Ericsson Globe Arena in Stockholm will host the Octagon’s debut in Sweden. FUEL TV will air the show in North America at 3PM ET/12PM PT.